Comparing and contrasting submodalities of different states or two different Internal Representations with each other and finding the critical submodalities. Eg When you think of something that you like do you have a picture? When you think of that picture is it black and white or colour, still or movie, bright or dark, big or small……? When you think of the situation that you dislike do you have a picture? When you think of that picture is it black and white or colour, still or movie, bright or dark, big or small……? Complete the exercise and compare your submodalities. 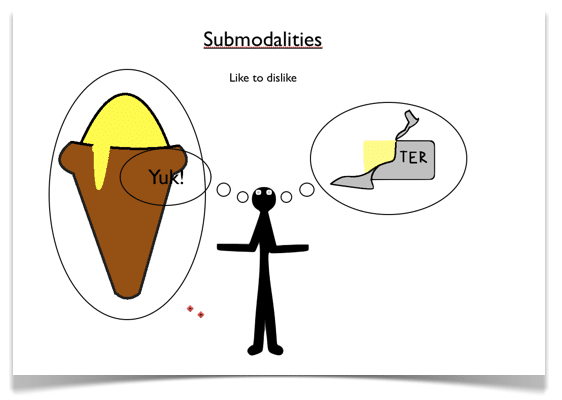 What can we change in our picture of what we dislike in order to replicate the submodalities of our picture of “like”? This works great for changing states, changing from procrastination to motivation for example. We cover this subject at NLP Practitioner Level on our NLP Training and NLP online training courses.